Scotland has a lot to be proud of. The care provided across Scotland, 365 days a year through our health and social care services is just one. 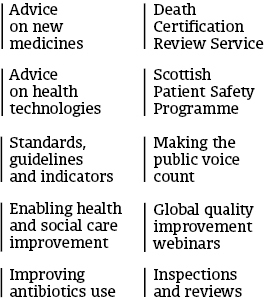 And I think we should add the Scottish Patient Safety Programme to the long list of things that we should shout about as notable Scottish achievements. As the head of Safety at HIS, you would probably expect me to say that, but that’s why it is great to also see that MSPs at Holyrood are today debating the progress made since the Safety programme launched nine years ago. So this is a perfect chance to reflect on what has been achieved, thank the staff who are making it happen, but also, and crucially, to ensure we are looking to the future and redoubling our efforts to make care as safe as it possibly can be. In Scotland, we can now say we’ve reduced the number of deaths you would expect to see in our hospitals through improvements in areas such as the early identification and management of Sepsis, reducing hospital associated infections and improved surgical care. The safety programme is helping to reduce the number of harms caused by medicines and the work within mental health has helped to bring about examples where the rates of violence and self-harm and the use of restraint in many wards has reduced substantially. The programme is also improving outcomes in maternity, neonatal and paediatric care for women, babies and children by focusing on providing safe, high quality care. These examples are practical demonstrations of better care and improved outcomes. While HIS oversees the programme, the real achievements are being delivered by those within the service, such as doctors, nurses, midwifes, dentists, managers, pharmacists, and care home staff – who provide safe and high quality care on a day to day basis, wherever you may access healthcare. I am sure MSPs will be expressing a similar sentiment on the floor of the Holyrood debating chamber, and that is really great to see. Of course, we haven’t cracked it – this journey is far from finished and there will always be new challenges and ambitions which the programme will work towards with the help of NHS Boards and Health and Social Care Partnerships to provide better, safer and higher quality care for Scotland. Again, I am sure today’s debate can make a strong contribution as we look to the future. The very basis of the safety programme is collaboration, and we are always looking to hear good ideas and fresh perspectives. While it is understandable that Scotland is viewed with envy from across the world and Norway, Denmark, Sweden, Australia, Mexico, Chile, Singapore and Tanzania, just to name a few, are working to emulate our successes in this area, the absolutely wrong path would be to rest on what we have already achieved. There is much more we can do to make care even safer, and we plan to go on working in partnership wherever we can, to write the next chapter of Scotland’s patient safety journey.